Download a blank fillable Dd Form 2710 - Prisoner Background Summary in PDF format just by clicking the "DOWNLOAD PDF" button. Complete Dd Form 2710 - Prisoner Background Summary with your personal data - all interactive fields are highlighted in places where you should type, access drop-down lists or select multiple-choice options. AUTHORITY: Chapter 48, title 10 U.S.C., Military Correctional Facilities, and DoD Instruction 1325.07.
also be used to evaluate progress toward rehabilitation or suitability for parole or clemency. when a prisoner is transferred to its custody for incarceration. 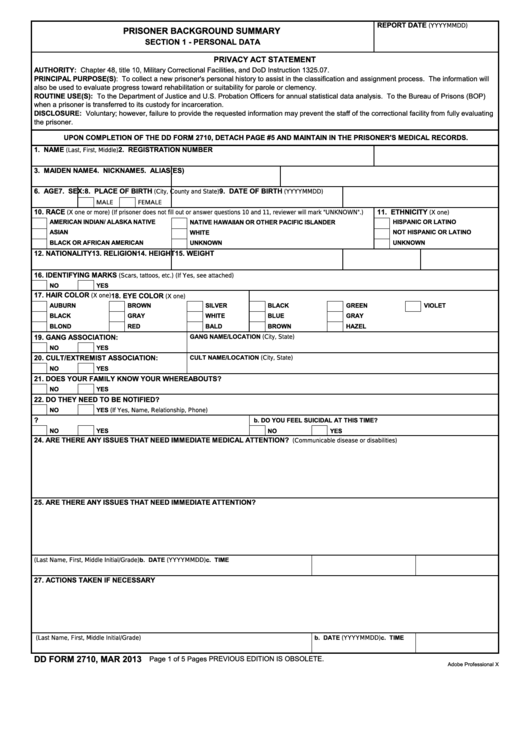 UPON COMPLETION OF THE DD FORM 2710, DETACH PAGE #5 AND MAINTAIN IN THE PRISONER'S MEDICAL RECORDS. 21. DOES YOUR FAMILY KNOW YOUR WHEREABOUTS? 22. DO THEY NEED TO BE NOTIFIED? 23.a. HAVE YOU EVER TRIED TO COMMIT SUICIDE? b. DO YOU FEEL SUICIDAL AT THIS TIME? 24. ARE THERE ANY ISSUES THAT NEED IMMEDIATE MEDICAL ATTENTION? 25. ARE THERE ANY ISSUES THAT NEED IMMEDIATE ATTENTION?